Self-taught meal planning guru & recipe developer who loves sharing ideas to save time and money in the kitchen and eat well. This post originally appeared in December 2012 but I’ve updated it with newer pictures and updated recipe formatting. 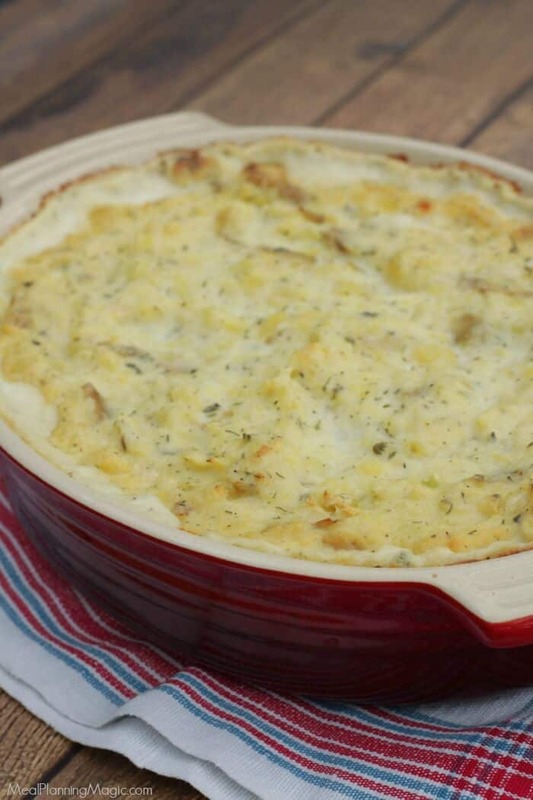 All the delicious flavors of this easy Garlic Herb Mashed Potatoes Casserole remain the same–still one of our favorites! By the way, you can read my review of that book here—it’s what helped me decide to start my freezer meal exchange group! Or check out my list of favorite freezer cooking cookbooks here. Ok, back to the potatoes. 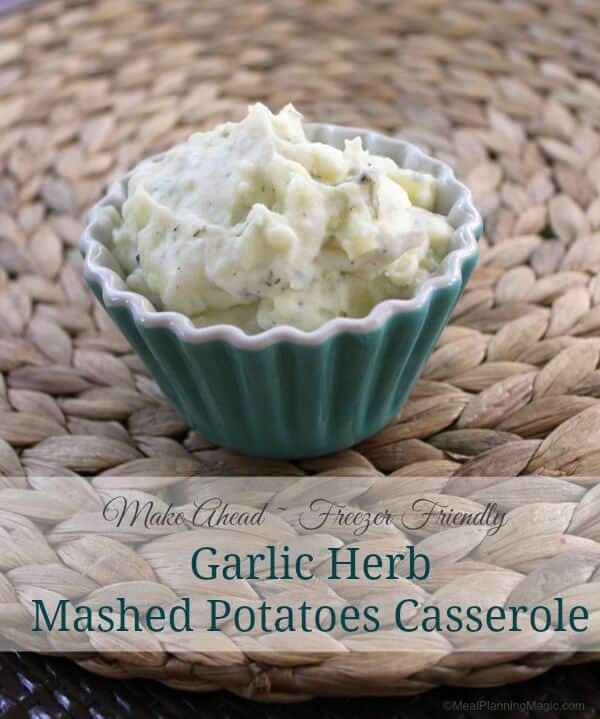 My family loves mashed potatoes and we love garlic mashed potatoes even more! Who would have thought that you could not only make mashed potatoes ahead of time but that you could freeze and reheat them for later? Yes indeed you can! I have made this recipe more times than I can count and have shared it often also with my freezer exchange group members. It is always a huge hit! The garlic herb cheese spread can actually be made up and frozen separately to use in all sorts of other ways if you like. I pretty much always just make it for these mashed potatoes. The nice thing is that it makes too casserole size dishes so there it plenty to go with your favorite entrée. It makes 8 servings per container so you can divide it up in half again to make four casseroles instead of two. 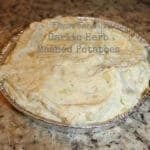 Garlic Herb Mashed Potatoes Casserole - Freezer Friendly! Blend or process, all ingredients until smooth. Portion and freeze. 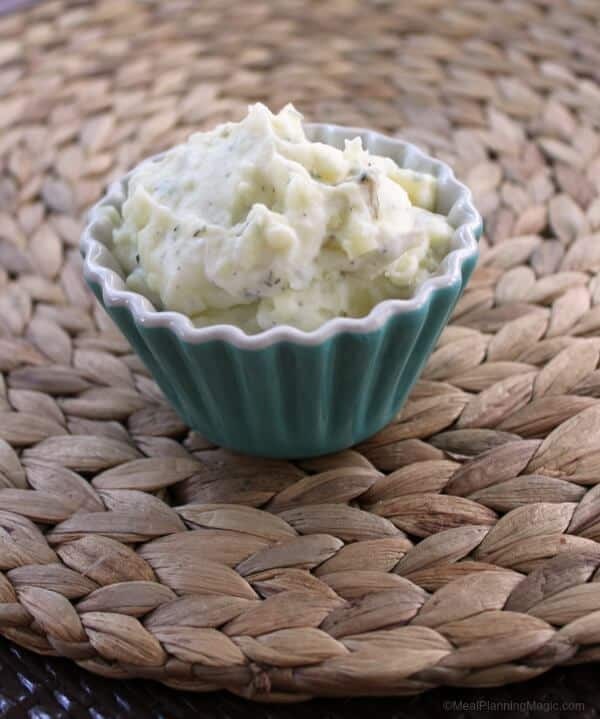 Defrost in refrigerator and serve as a dip or spread at room temperature. 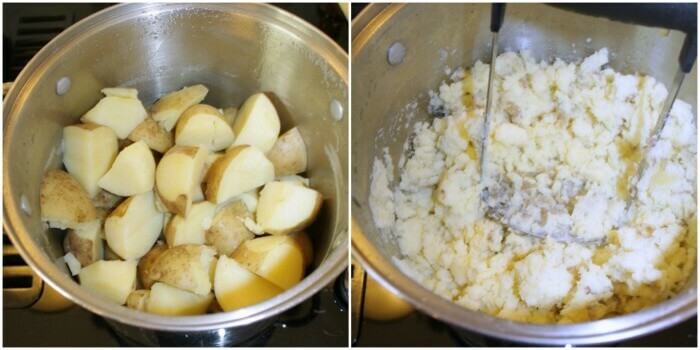 Peel potatoes and cut into 2-inch chunks. Place in a 5 to 6 quart pan. Add water to cover, bring to a boil over high heat. Reduce heat to low. Simmer until the potatoes are very tender about 20-25 minutes. Drain and return potatoes to the pan. Mash potatoes with a potato masher until light and dry. Stir in cheese and milk. Mash until smooth. Add salt and pepper to taste. Cool potatoes to room temperature. 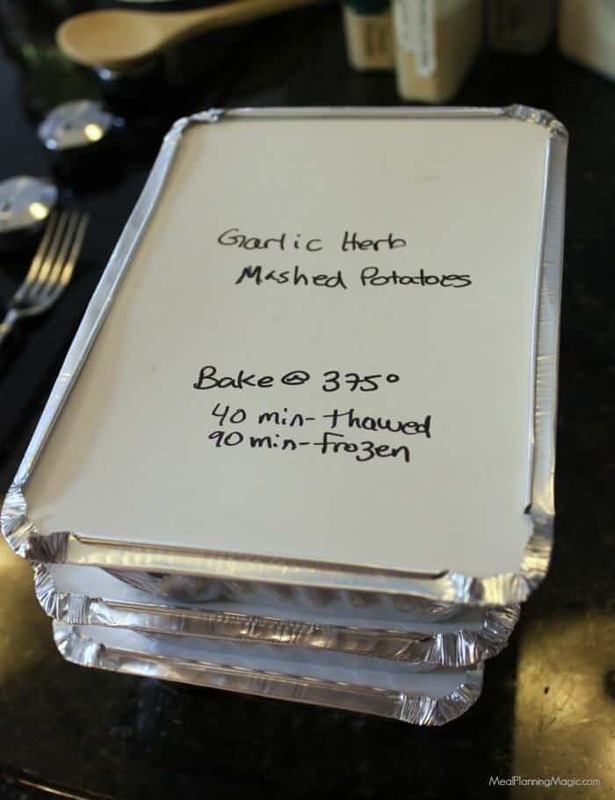 Divide potatoes into tins and cover with plastic wrap and then foil or /Ziploc bags. Potatoes look watery before freezing, but the water will be absorbed as they bake. 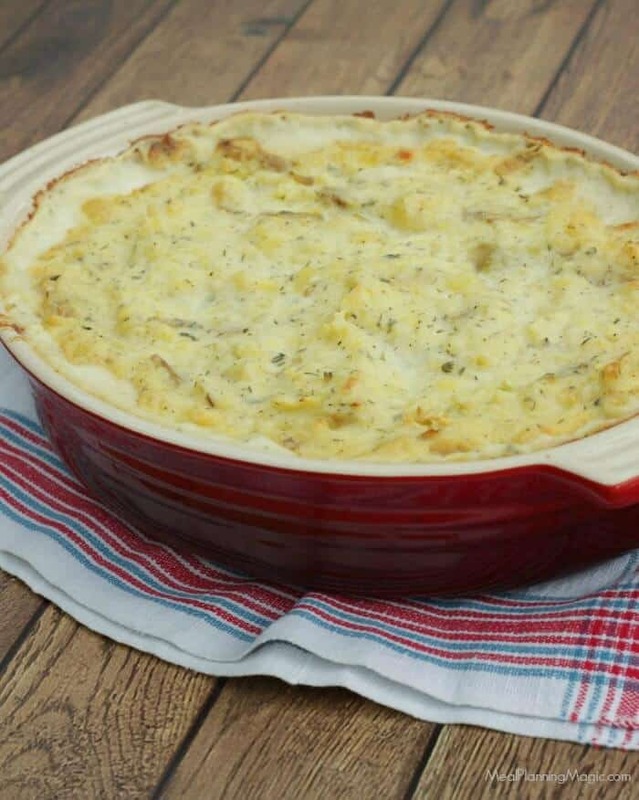 You can substitute russet potatoes if you prefer, but I think Yukon Gold potatoes yield a more creamy, flavorful potato casserole. Reheat covered with foil at 375 degrees, 40 minutes for thawed potatoes, 90 minutes straight from freezer. Tried this recipe?Mention @mealplanmom or tag #mealplanningmagic on Instagram when you share your photos! I hope you’ll give it a try. I bet it will become a favorite of yours too! Hi, I’m Brenda and I’m glad you’re here! I’m a busy mom, foodie and self-taught meal planner sharing tips, ideas, products and recipes that help you save time, save money and eat well. I believe there’s no “one size fits all” approach to meal planning. GET A FREE WEEKLY MENU PLAN PRINTABLE WHEN YOU SUBSCRIBE! Meal Planning Magic is a participant in the Amazon Services LLC Associates Program, an affiliate advertising program designed to provide a means for sites to earn advertising fees by advertising and linking to amazon.com. Ordering products mentioned here are at no extra cost to you. Thank you for your support. To discover many of my favorite items, click here to browse my Amazon shop. Get more meal planning, recipes, money saving and organizing ideas by signing up to my newsletter. Alternatively, subscribe to Meal Planning Magic by RSS, Facebook, Twitter, Pinterest, or Instagram. Or join the Meal Planning Magic Community Table Facebook Group where you can ask questions and get ideas for meal planning, saving money, recipes and more!